Sculpture in Stone (MFA), no. 067; Sculpture in Stone and Bronze (MFA), p. 108 (additional published references). The lady wearing a chiton and himation, doubtless a young mother, is holding a dove in her right hand, extending it down toward the ground in front of her. The wings of the mourning siren and other details have been finished in paint. 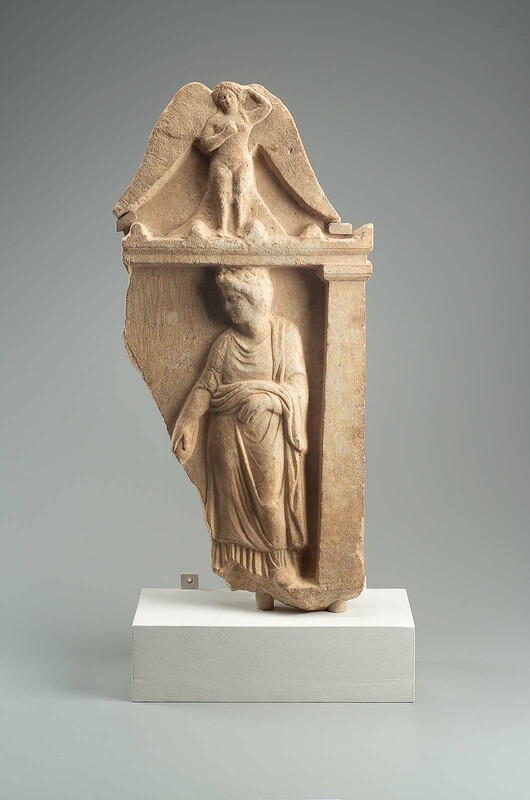 The scene is framed by a naiskos which is probably composed of an anta to either side crowned by a shallow architrave; the left-most side of the relief is broken and missing. The surfaces are somewhat weathered.This is a canonical form of second-level Attic funerary monument. Attribution - Mt. Pentelikon (near Athens). Justification - C and O isotopes, fine grain, pure white, Attic style and type.